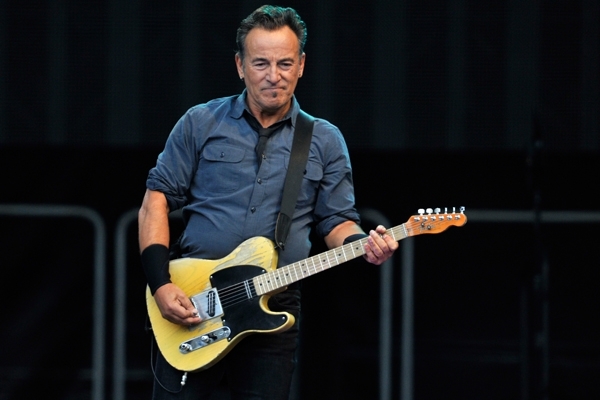 Bruce Springsteen yesterday dedicated a performance of "American Skin (41 Shots)" to Trayvon Martin, the Florida teen slain by neighborhood watch volunteer George Zimmerman in 2012. Zimmerman was acquitted last weekend of murder and manslaughter charges in the case. The rocker played the song during a show in Limerick, Ireland, after he saw an audience member holding up a placard with the title written on it, according to The Star Ledger of Newark, New Jersey. "He said, 'Where is that sign?' and grabbed it," a concert-goer said. "He then said, 'I want to send this one out as a letter back home. For justice for Trayvon Martin.'" Zimmerman's acquittal in the Martin case has sparked protests around the U.S., with some musicians going online to express their thoughts on the verdict. The not-guilty finding prompted Stevie Wonder to announce a boycott of Florida and anyplace else with a "Stand Your Ground" law, which permits the use of force in self-defense without an obligation to retreat first.